Practicing attorney since April 2004. President of the young lawyers group from Ilustre Colegio de Abogados de Granada (Granada’s School of Lawyers), since January 2009 to the present time. Assistant Director of Colegio Mayor Isabel la Católica de la Universidad de Granada. Years 2004-2007. Municipal Coordinator of Ayuntamiento de Ogíjares (Granada). Advisor of the Government Assistant Delegate in Granada. Head of the Office of the Ayuntamiento de Almuñécar (Granada). 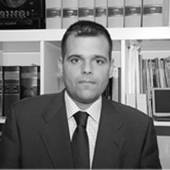 Member of the Spanish Association of Judicial and Arbitral Mediatiors. Advanced Studies Diploma granted by Universidad de Granada, after the reading and public defense of the piece “La protección jurídica del inversor en España. Las instituciones supervisoras básicas” (“The legal protection of the investor in Spain. Directing abilities course taken at Escuela de Negocios EOI (School of Business EOI). Author of the doctoral thesis “Contratación electrónica y turismo. ¿Un problema de política legislativa?” (“Electronic contracting and turism”. ¿A problem for legislative politics?”) presented at the general registry of Universidad de Granada on September 2009. Pending reading and public defense. Tourist services online contracting. Consumer’s special protection in Spain. Given at the UniCEUB of Brasilia. (Brazil). May 2008. Services lenders responsibility in the information society. Pronounced in the Torts Law Master of the University of Montevideo (Uruguay). October 2009. Services lenders responsibility in the information society. Pronounced at the V International Congress of Private Law on Punta del Este (Uruguay). October 2009.